Is the S5 Mini more than just a small upgrade? Samsung's Galaxy S4 Mini was a popular little smartphone and one we were rather fond of too, but it's had its time to shine and soon it will be taking a back seat to the Samsung Galaxy S5 Mini (although we all know it'll be on the shop shelves for the next 7,000 years still). The question is, just what has changed in the new handset? And is it really much better than its predecessor? Well strap in, and prepare your brain for answers to both of those questions... plus, there will also be some pictures too. Keep your hands and arms inside the carriage. The Samsung Galaxy S5 Mini is basically just a shrunken-down Samsung Galaxy S5, so the name is rather fitting. It has a perforated plastic back cover and a shiny metallic edge, but don't be fooled, it's plastic through and through. At 131.1 x 64.8 x 9.1mm and 120g it's obviously smaller and lighter than the Galaxy S5, but it's not exactly tiny. The Samsung Galaxy S4 Mini takes the same approach (funnily enough), being as it is a smaller version of the Samsung Galaxy S4, at least on the surface, with a plastic back and faux-metallic edge. In fact it looks a lot like the Galaxy S5 Mini too, except slightly more rounded and less industrial looking. At 124.6 x 61.3 x 8.9mm and 107g it's also smaller, lighter and ever so slightly slimmer than its successor. However the Galaxy S5 Mini is definitely the more durable of the two, as it's IP67 certified dust and water resistant, which the Galaxy S4 Mini isn't. The Galaxy S4 Mini has a 4.3 inch 540 x 960 Super AMOLED display with a pixel density of 256 pixels per inch. It's a decent, bright screen but the resolution is a little on the low end. 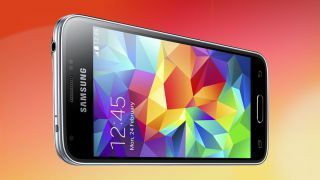 Not so in the Galaxy S5 Mini with its 4.5 inch 720 x 1280 Super AMOLED display. OK, so that's still not Full HD, but it's a substantial improvement over the S4 Mini, and gives it a much sharper 326 pixels per inch, despite the increased size. Samsung's tucked a fair bit of power away behind the Galaxy S5 Mini's diminutive shell. It has an own-brand 1.4GHz quad-core processor and 1.5GB of RAM, which puts it close to high-end, although without all the power and efficiency of the Snapdragon 801 that resides in the full-fat Galaxy S5. Assuming Samsung's in-house processor is any good that's quite an upgrade over the Galaxy S4 Mini which is lumbered with a 1.7GHz dual-core Snapdragon 400 processor, though it manages the same amount of RAM at 1.5GB. These are both Android handsets and both use Samsung's TouchWiz interface. However while the Samsung Galaxy S5 Mini is launching with Android 4.4, the Galaxy S4 Mini is currently still on Android 4.3. We wouldn't be surprised if the S4 Mini gets an upgrade, but the S5 Mini is likely to be supported with software updates for longer, and will be earlier to get a taste of Android L when it launches later in the year. There's very little different on the camera front. Both phones have an 8 megapixel rear snapper complete with an LED flash, but selfie fans can rejoice as the Galaxy S5 Mini fares slightly better with a 2.1 megapixel front-facing camera, compared to the Galaxy S4 Mini's 1.9 megapixel offering. We were quite impressed by the Galaxy S4 Mini's camera both for its photo quality and variety of modes and options and we expect the same will be true of the Galaxy S5 Mini. It's a shame that the megapixel count hasn't been upped, but if Samsung has improved the sensor and software then the amount of pixels is irrelevant, as 8MP is more than enough to get a good picture.